If a picture is worth a thousand words, than Man and Shark is a must for anyone interested in shark fisheries and conservation issues. 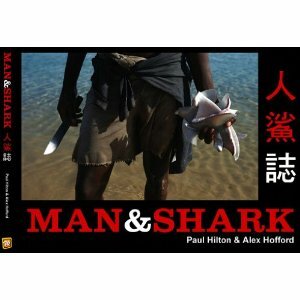 This book by Alex Hofford and Paul Hilton features a collection of incredible photographs of sharks and shark fishing from all over the planet, from the fishing ports of the developing world to the markets of Asia and the kitchens and restaurants where shark fin soup is prepared and served. The list of 14 contributing conservation photographers features some of the world’s best. Each chapter features a brief introduction (in both English and Mandarin Chinese) explaining key points about shark biology or conservation, followed by a series of stunning, and in some cases horrifying, photos which showcase both the diversity of living sharks and the global industrial scale of shark fisheries. Photos of finned sharks lying on the seabed paired with interviews from fisheries biologists and conservationists gets the message across concisely, directly and effectively. Man and Shark is a passionate call for humans to change our relationship with the oceans, and I commend Paul and Alex for their excellent contribution to the world of shark conservation. Does shark conservation result in more shark attacks? Yeah, that would be expensive…. but it’s not what the book costs. It costs $35. Where are you getting $250 from?